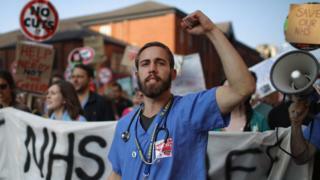 Junior doctor leaders have promised to fight on after the government in England announced it will impose a new contract on the profession. The British Medical Association said it was "considering all options" as the dispute threatens to escalate further. It comes after Health Secretary Jeremy Hunt said he had been left with no choice but to act - just hours after the latest doctor strike ended. The union refused to accept a "take-it-or-leave-it" offer on Wednesday. BMA junior doctor leader Dr Johann Malawana said the contract was "flawed" and they had put forward a "fair and affordable" alternative. "The government's shambolic handling of this process from start to finish has totally alienated a generation of junior doctors - the hospital doctors and GPs of the future, and there is a real risk that some will vote with their feet. "Our message to the government is clear - junior doctors cannot and will not accept a contract that is bad for the future of patient care, the profession and the NHS as a whole, and we will consider all options open to us." The stance raises the prospect of more strikes, while behind the scenes there has been talk of legal action, mass resignations and doctors refusing to sign contracts. What's is the latest contract offer? Ministers took the decision to impose the contract after their chief negotiator Sir David Dalton had advised them to do "whatever necessary" to end the deadlock. He said the final offer, which was made on Tuesday, on the eve of the strike, and rejected on Wednesday, when the walk-out was in full swing, was fair. It included a concession on Saturday pay, which would have meant doctors working at least one in four Saturdays would get extra pay above the basic rate. It has also emerged that the changes - along with other concessions made - mean the average rise in basic pay equates to 13.5% not 11% as previously thought, the government said. But one in four junior doctors will still have to have their pay packets topped up under the pay protection guarantee to ensure those already working in the health service do not lose out. Speaking in the House of Commons, Mr Hunt said the contract was an "important step" in improving care at weekends. He said the government's door had "remained open for three years" but the BMA had proved "unwilling" to show flexibility and compromise. "While I understand that this process has generated considerable dismay among junior doctors, I believe that the new contract we are introducing is one that, in time, can command the confidence of both the workforce and their employers." But Shadow Health Secretary Heidi Alexander said: "This whole dispute could have been handled so differently. "The health secretary's failure to listen to junior doctors, his deeply dubious misrepresentation of research about care at weekends and his desire to make these contract negotiations into a symbolic fight for delivery of seven-day services has led to a situation which has been unprecedented in my lifetime." In theory, it's pretty easy. Junior doctors rotate through jobs quickly so within a year of the new contract coming into force in August the majority of the 55,000-strong workforce would be on it. All new doctors graduating from medical school will also go on it. There are some who are on longer contracts, who will not go on it straight away, while others will have completed their training before it affects them. This group represents about a fifth of the workforce, it is thought. Between now and the summer hospitals will have to review their rotas and staffing requirements, before sending out offers to junior doctors in May. But the big unknown is how the British Medical Association and medical workforce will react. While in the long-term doctors have warned of "brain-drain" with medics heading abroad, to other parts of the UK or into other sectors, such as the drugs industry. This, it seems, is uncharted territory - imposing a whole new contract on doctors like this has never been done before it is believed. The government appears to be planning to impose the contracts from August. Chris Ham, chief executive of the the King's Fund think tank, said no government has ever previously imposed a contract on junior doctors, and to do so would be a "huge risk". "As long as that public support for junior doctors remains in place, the government has an uphill struggle to persuade the public it's doing the right thing at the right time. "Nobody argues against seven-day working. But there's a really important discussion to be had. Will the junior doctors' contract really help that - or are other things far more important? The government really is entering very dangerous territory."